The Nuffield Scholars – USA program, is now formally established as a Delaware Corporation and as a tax exempt, non-profit organisation under Section 501(c)(3) of the U.S. Internal Revenue Code. Ed Kee – President. Secretary of Agriculture, State of Delaware; former vegetable crops specialist for the University of Delaware. Jean Lonie – Vice President. Director of Student Recruitment, College of Agriculture, Pennsylvania State University. Jim Geltch – Secretary/Treasurer. Chair, Nuffield International Scholars. Former CEO of Nuffield Australia. Nuffield Scholar, 1986. Farmer, New South Wales, Australia. Barton Ruth – Director. Farmer, Rising City, Nebraska. Former Eisenhower Fellow. Past President of the American Soybean Association. Bill Northey – Director. Secretary of Agriculture, State of Iowa. Farmer. Past President of the National Corn Growers Association. In addition to becoming formally organised, Jim Geltch and Ed Kee have visited California, the Midwest and Eastern U.S. to introduce the Nuffield program and philosophy to potential supporters and to network with many others to identify and encourage potential Scholar candidates. The first board meeting was held on November 21, at Holiday Inn Express, Omaha, 2010 Abbott Drive, Clear Lake, Iowa. 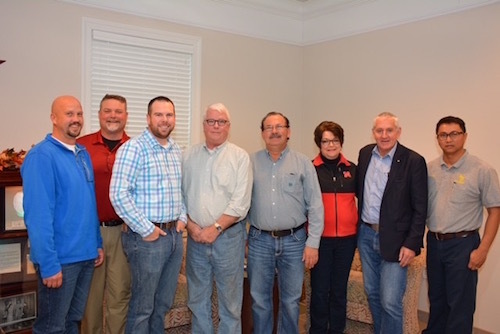 Ed Kee and Jim Geltch met with four Nebraskan famers who had travelled to Delaware to meet with farmers, researchers, and processors about the viability of setting up a chicken industry in Nebraska. A large supermarket chain, Costco is building a processing plant in Nebraska and has approached several farmers with supply contracts. This mission, organised by Ed, was to assist the farmers in their assessment of the proposal. This meeting came abut due to the Nuffield network. Jim arranged for Ed to meet Bart Ruth in Nebraska and Bart’s son Geoff led this small delegation to Delaware after and invitation from Ed. The key driver for the farmers was the potential supply of chicken manure. First Nuffield International Scholar from the U.S.A.
Poultry farmer Georgie Cartanza, from Dover, Delaware, is the first American to receive a Nuffield International Scholarship, one of 90 farmers from around the world to participate in the global agricultural scholarship program. Cartanza, who recently began work as poultry extension specialist with the University of Delaware, will be spending 16 weeks overseas studying farming technology and production efficiencies. She will travel to China, Brazil, Canada, Israel, the United Kingdom, France, Italy and The Netherlands, learning about topics including production needs, extreme climates, consumer demands, food safety and organic poultry transitions. Cartanza has worked with poultry for more than 20 years, including time with Mountaire and Perdue. She has raised poultry on her farm near Dover for the last ten years, and has raised organic chickens since April 2015. She began her new position as UD poultry extension agent on 1st December. and will continue to farm.